Peruvian President Pedro Pablo Kuczynski and right-wing opposition leader Keiko Fujimori promised on Monday to work together for the good of the country following their first meeting since facing off in a divisive election in June. 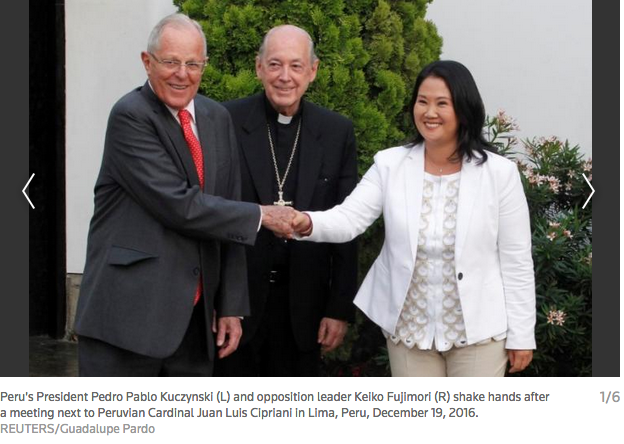 The hour-long meeting, proposed and mediated by Catholic Cardinal Juan Luis Cipriani, aimed at seeking a political truce after Fujimori's party pushed a motion through Congress last week ousting Kuczynski's education minister despite his pleas to spare him. Kuczynski's defeat in that battle so early in his government spotlighted the power that Fujimori wields as the president of the Popular Force party that holds an absolute majority of seats in the single-chamber Congress. Standing in front of Cipriani's home following the meeting, Fujimori noted that her party supported Kuczynski's initial series of reforms and approved his 2017 budget despite political differences with his government. "But those differences are put aside and we're going to put Peru first as we always have," Fujimori told journalists in a rare public appearance since she lost her second presidential bid by just tens of thousands of votes. Fujimori, a former congresswoman and the eldest daughter of imprisoned former authoritarian President Alberto Fujimori, said Popular Force would remain a force for "constructive opposition" in Kuczynski's five-year term. Fujimori and Kuczynski, a 78-year-old former Wall Street banker, smiled as they shook hands for the cameras. Cipriani's office released a photo of the two praying with him before an altar. "There will always be some difference here and there, but I have no doubt we can work together to promote a Peru that reaches 2021 with prosperity and modernity," Kuczynski said. The gestures could help ease concerns over the possibility of increasing political instability in Kuczynski's government as he seeks to shore up investments that have slumped for three straight years . Kuczynski's decision not to escalate the conflict with Popular Force and his willingness to meet Fujimori at the behest of a religious leader has angered leftists who rallied behind him to defeat her in one of the tightest elections in Peru's history. Popular Force lawmakers said they forced the education minister from office because of alleged corruption on his watch, but their critics said the vote was a show of strength and an attempt to defend private universities unhappy with his reforms. The heated debate had prompted calls for Kuczynski to dissolve Congress.